Carbon dioxide capture and storage (CCS) is a mid-term commercially viable technological option to reduce anthropogenic GHG emissions and best applied to large point sources including fossil fuel power plants, fuel processing plants, and industrial plants (iron and steel, cement, and petrochemicals). CO2 capture, its transportation, and storage are three main steps in CCS technology. Among these, CO2 capture is very expensive and hence considered the most critical one. CO2 can be captured using different techniques, including absorption, membranes, cryogenic distillation systems, and adsorption. In recent years, CO2 adsorption onto solid sorbents has been widely investigated as a means of an alternative to benchmark absorption technology. The selection of a suitable CO2 adsorbent is a daunting task, as the CO2 needs to be captured from large point sources under different conditions of operation and feed-gas composition. Evidently, each capture scenario presents unique requirements and constraints. The extensive review of literature reveals that numerous classes of solid sorbents have been explored for effective CO2 capture. However, each of these classes of solid sorbents presents its own advantageous characteristics and intrinsic limitations as well, providing scope for further research. The primary objective of the research is to investigate the adsorption of CO2 on different types of solid sorbents that have been synthesized with different schemes for property enhancement. Using a laboratory scale single-column ﬁxed-bed adsorption unit, the group has investigated the CO2 capture properties of different types of solid sorbents, including; (i) Layered double hydroxide derived mixed oxides (LDHs), (ii) Carbon-based sorbents from waste biomass resources, and (iii) Titania-based adsorbent. In order to enhance the CO2 capture properties of LDHs, the strategies such as K2CO3 impregnation, carbon based support, and development of composite have been explored. It was found that the addition of support material increased the surface area of neat Mg-Al LDH, leading to enhanced sorption capacity. 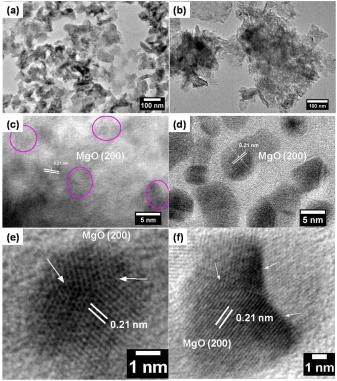 Alkali metal carbonate impregnation on CGM-supported Mg-Al LDH generated high basic site density due to increased defects concentration, resulting in further enhancement of sorption capacity. The carbonaceous material obtained from Mesua ferrea L. seed cake using HTC technique also has been explored for CO2 capture. The seeds of Mesua ferrea L. tree, containing 60 – 63% extractable oil, were found to be promising precursors for non-edible oil based biodiesel production. Seed cake is the by-product of biodiesel production and is a waste being disposed. The utilization of such seed cake for synthesis of valuable carbon materials is always advantageous over other biomass based precursors in many aspects. Manufacture of value-added products using low-value byproducts of biodiesel production will definitely help in the commercialization of biodiesel. Additionally, these plants have to be grown only once, which later on provides continuous support for carbon sequestration by afforestation and reforestation. Carbon sequestration by forests has been considered a promising near-term mitigation option for anthropogenic greenhouse gas (GHG) emission. Thus, development of CO2 adsorbent using aforesaid kind of biomass waste provides potential means of addressing current global challenges, namely energy insecurity and climate change through an integrated approach towards sustainable development. Climate change due to anthropogenic emission of greenhouse gases (GHGs) and energy insecurity in the face of depleting fossil fuel reserves along with increasing demand and rise in prices compelled the humankind to explore alternative renewable energy sources. These renewable sustainable energy sources include solar, wind and geothermal energy; bioenergy (bioethanol, biodiesel, biohydrogen) and bioelectricity. 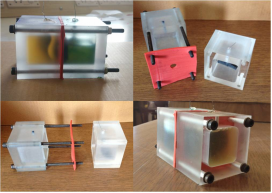 In recent years, there has been a great deal of interest in bioelectricity production using microbial fuel cells (MFCs). In MFCs, bacteria are used to catalyze the conversion of organic matter into electricity. Due to thermodynamic constraints, the power generated by MFC reactors is very low. The major challenges for commercial viability of MFCs are exorbitant cost of fuel cell components, low power density, fluctuating power output, high internal resistance, and non-linearity in scale-up. Hence, the many objectives of current research on MFCs include: (i) Development of MFCs for designated application, (ii) Electrode material and reactor architecture improvement, (iii) Exploration of novel microorganisms with enhanced capacities for sustained, efficient electricity production, and (iv) Optimization of operational conditions. Another major area of interest in this lab involves the investigation of novel microbes to be applied in MFC for bioelectricity production and development of MFC prototypes. To this effect, gram-positive facultative anaerobic bacterium Bacillus coagulans has been engaged for the first time to the Microbial fuel cell. Optimization of media components and the MFC parameters could be an important factor in increasing the power output of an MFC. It has been found that Bacillus coagulans in an un-optimized condition produced open circuit voltage of nearly 0.600 V. Under optimized conditions with a prototype a maximum OCV of 0.720 V can be obtained for approximately 3 h for Bacillus coagulans under tested conditions. Low-temperature CO2 adsorption on Titania nanotubes (TNTs). Lakshminarayana K.G, S. Subramanyam, C. D. Madhusoodana, Umananda M. Bhatta, Venkatesh K. Surfaces and Interfaces (2017) 8:158-162. Fume hood, Silicon carbide tubular furnace, Microwave reactor, Oven, Muffle furnace, Water bath and others. Lakshminarayana Bhatta obtained his Doctoral degree from VTU for his thesis work entitled “Studies on Novel Sorbents for CO2 Capture for Environmental Applications” that he undertook jointly with BHEL and CPRI. 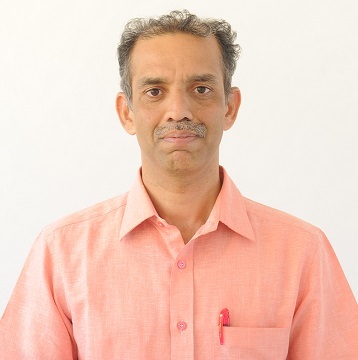 With a Master’s in Chemistry from Kuvempu University, Karnataka in 1998 he started his career in a pharmaceutical industry at Bangalore as a quality control executive. He has a good exposure to various pharmaceutical industrial practices and obtained a firsthand experience in handling various chemical instruments, including GC, HPLC, FTIR, and AAS. His fascination for teaching led him to join BMS College of Engineering, Bangalore as a lecturer. Prior to current affiliation, he served in different educational institutions in various capacities, motivating the students to develop creative ways to acquire the knowledge and skills and put them into practice. He has taught various courses, including engineering chemistry, environmental studies, fundamentals of chemistry and physical chemistry. About eight years ago, the current global challenges such as energy crisis and climate change caught his attention and motivated him to focus his interest on energy & environment. Since then, he has been working on the development of solid sorbents for CO2 capture, microbial fuel cell, and biofuel. He has taught allied subjects such as Environmental engineering and Climate change technology for master’s programs in energy engineering and energy management. Further, he has guided many postgraduate research projects and successfully completed projects funded by DRDO, GTRE and TUV. He has several publications to his credit and authored a text book entitled “Environmental Studies” for engineering students of VTU. He is also a member of several technical non-profit organizations. His research interests include Energy efficiency, Environmental engineering, Carbon footprint, and Green chemistry. His spare time interests & hobbies include reading Kannada literature, writing articles for magazines and newspaper, trekking, nature-watching, travelling, listening Indian classical music, and interacting at social and personal front with people from all walks of life to better understand the fellow human beings and currently works as a Professor.